Just as firefighters are getting a handle on the Loma Fire in the Santa Cruz Mountains, residents have another potential disaster looming: mudlsides. Cal Fire was still dousing hot spots at the Loma Fire, which has burned nearly 4,500 acres and is near 100 percent containment. But now rain is just around the corner, forecast for later this week. "There's going to be spot fires for a few days, but if you look around, you'll see there's not much left to burn here anyway," said resident Norman Noble, whose home was spared by the flames. 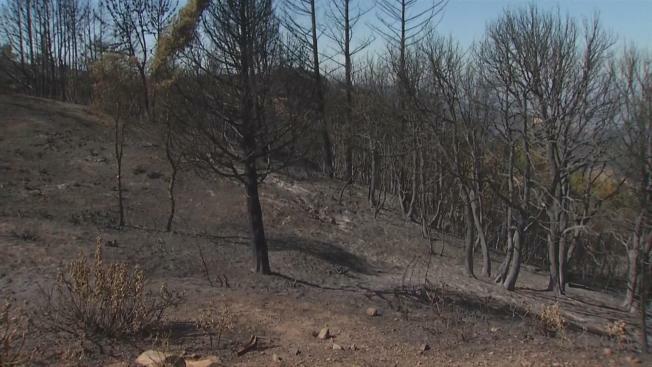 Cal Fire agreed, saying that for many of the burned areas, the priority now is preparing for upcoming rains and erosion. "There's nothing that's going to stop or fill to the rain, so it's basically going to fall, and it's going to rush off as a big mudslide," said incident Cmdr. Mike Mathiesen. Santa Clara County's Office of Emergency Services will coordinate erosion repair efforts for most of the fire area. Cal Fire and homeowners are already doing what they can. "So for the past seven days, we've been working with excavators and masticators, water tenders and re-vegetating a lot of the containment lines that we put in," Mathiesen said. Noble said he'll spread straw and seed and sandbags in critical areas. "Cal Fire is already putting out some sandbags," he said. "What I want to see is gentle rains, not heavy rains." Cal Fire is also busy putting together a Winter emergency response team of agencies, including OES, the water district and open space agencies, to help the area prepare for possible mudslides, even as it is still recovering from the fire.